ww2dbaseThe battlecruiser Scharnhorst was commissioned early 1939, but returned to the shipyards in mid-1939 for a new main mast and a new bow that was more fitting for North Atlantic duties. Her first operation was a sweep into the Iceland-Faroes passage in Nov 1939 along with her sister ship Gneisenau; she sank the British Armed Merchant Cruiser Rawalpindi. On 9 Apr 1940, the two sister battlecruisers engaged the British battlecruiser Renown, but the engagement was inconclusive. Two months later, the pair sank the British carrier Glorious and her escorting destroyers Arcasta and Ardent off Norway, but Scharnhorst incurred torpedo damage and was under repairs until late Dec 1940. As soon as her repairs were completed, she paired up with Gneisenau once again to raid the merchant shipping in the North Atlantic, but was turned back by heavy seas. She continued to participate in the raider role in early 1941, avoiding British capital ships and air power while preying on lightly escorted convoys in the North Atlantic off Iceland, Greenland, and Newfoundland. She ported in Brest on the French coast on 22 Mar after a successful run sinking 8 ships totaling 49,300 tons. ww2dbaseWhile in Brest, Scharnhorst and the other German ships were subjected to British air attacks, keeping her unavailable for operations until late 1941 or early 1942. In Feb 1942, she left Brest along with Gneisenau and heavy cruiser Prinz Eugen for Germany through the English Channel. Much to the embarrassment of the British, the ships were unable to stop the fleet; however, Scharnhorst and Gneisenau were damaged by mines. ww2dbaseRepair work and various troubles kept Scharnhorst in the shipyards until Mar 1943 when she left for Norway for training exercises. On 25 Dec 1943, she left port under the command of Rear Admiral Erich Bey to hunt down convoys JW 55B and RA 55A destined for northern Russian ports. With the aid of code breakers, British Admiralty learned of her approximate locations, and sent out a fleet to hunt her down. A force of three cruisers consisting of Belfast, Norfolk, and Sheffield damaged Scharnhorst's radar before Scharnhorst broke away from combat. That afternoon, British battleship Duke of York and her escorts caught up with Scharnhorst and opened fire, damaging a turret and the hangar in the first round of battle, then caught up with Scharnhorst again for a second round, this time detonating Scharnhorst's magazines. At 1820 another round from Duke of York destroyed a boiler room, reducing her speed to about 22 knots leaving her open to attacks from the destroyers. Scharnhorst was then chased by Duke of York, the cruiser Jamaica, and the destroyers Musketeer, Matchless, Opportune, and Virago. 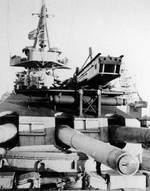 After sustaining a series of attacks by gunfire and torpedoes, she sank at 1945 on 26 Dec 1943. Only 36 survived. 7 Jan 1939 Scharnhorst was commissioned into service. 18 Feb 1940 German battlecruiser Scharnhorst embarked on Operation Nordmark, aiming to intercept British convoy traffic in the North Sea. 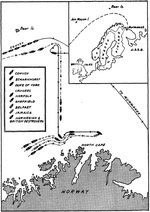 8 Jun 1940 During Operation Juno, Scharnhorst and Gneisenau opened fired on British carrier HMS Glorious and her escorts about 170 miles west of Narvik, Norway at 1630 hours, sinking destroyer HMS Ardent at 1720 hours (killing 151) and the carrier at 1910 hours (1,515 killed, 43 survived). Scharnhorst suffered one torpedo hit by HMS Ardent. 21 Nov 1940 German warships Scharnhorst, Gneisenau, Köln, and Leipzig departed for a sweep against Allied shipping between Iceland and the Faroe Islands. 27 Feb 1941 German battlecruisers Scharnhorst and Gneisenau refueld from tankers Ermland and Friedrich Breme 1,000 miles west of the Azores. They also transferred 180 prisoners taken from Allied ships sunk on 22 Feb.
3 Mar 1941 German battlecruisers Scharnhorst and Gneisenau reached the Cape Verde Islands area in Central Atlantic. 9 Mar 1941 German cruiser Scharnhorst sank Greek ship Marathon 250 miles north of Cape Verde Islands after taking the entire crew prisoner. 28 Mar 1941 En route to Brest, France, German cruisers Scharnhorst and Gneisenau were spotted by a British Spitfire fighter pilot. 31 Mar 1941 Before dawn, 109 RAF bombers attacked German warships Scharnhorst and Gneisenau in Brest, France, scoring no hits. 3 Apr 1941 Overnight, RAF unsuccessfully attacked German cruisers Scharnhorst and Gneisenau at Brest, France, but some German naval officers were killed when a bomb struck the Continental Hotel in the city. 23 Jul 1941 Scharnhorst was detected by British RAF Coastal Command aircraft at La Pallice, La Rochelle, France by the results of a photo reconnaissance flight at 0915 hours. 19 Dec 1941 In a daring daylight raid by 41 RAF Manchester bombers on the French port of Brest, the gates to the dock containing the German battlecruiser Scharnhorst were so badly damaged that the mighty warship would be confined at the port for a further month. Two aircraft of No. 97 Squadron were lost to ground fire and Luftwaffe fighters. 8 Sep 1943 Operation Sizilien: Scharnhorst attacked the Allied base at Spitzbergen. The British Armed Merchant Cruiser Rawalpindi was commanded by Captain Edward Coverley Kennedy RN. He had been retired from the Navy for eighteen years, and was by 1939 nearing his sixtieth birthday. He was therefore rather pleased at being recalled to the service and given his own command. Captain Kennedy was also the father of the famous British journalist, broadcaster and author-Sir Ludovic Kennedy, who also served as a Lieutenant on Destroyers during the war. This ship is not a Battlecruiser by any standard definition but a Battleship. It is a Battlecruiser not a Battleship, the definition of which is it is designed to outrun what it cannot outfight, its paltry 11 inch guns would be found wanting against all Battleships, unless very old or obsolete.